Ever since Plasma Active was released in 2012, I’ve been waiting for KDE to release another desktop environment for mobile devices. Last week, that wait was finally over with the first alpha release of Plasma Mobile, Active’s successor. However, delay may have raised my expectations too high. While Active was full of innovations, so far, Mobile is simply another desktop for phones or tablets, appearing little different from what I currently have on my Android devices. Its main interest is the applications it includes, which seems to indicate Plasma Mobile’s design priorities. What made Plasma Active such a standout was its innovations. It was KDE with a different desktop environment — a proof of concept of KDE 4’s arrangement of the desktop as a sub-system that could be swapped out for another with relative ease. Even more importantly, it innovated. Like Ubuntu Touch — which I suspect it inspired — Plasma Active worked by the user swiping from the sides of the screen. It also included an OsS X-like spinner rack for changing Activities, a widget so efficient that I wished that standard Plasma would include it, too. As I wrote at the time, it was the first desktop for mobile devices that did not feel like a clumsy makeshift, and could even work well on a laptop or workstation. Unfortunately, however, Plasma Active never made it on to any shipped devices. 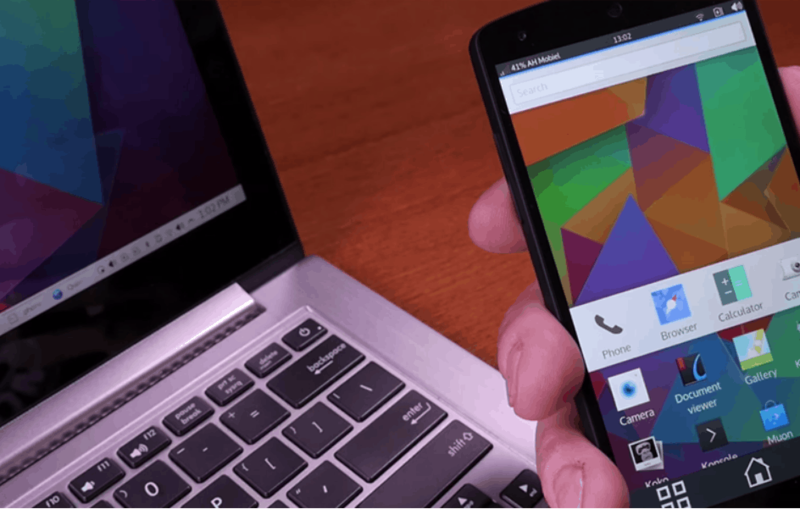 By contrast, Plasma Mobile has already received publicity, thanks to the announcement that Purism’s free and secure phone the Librem 5 would include it as one of the available desktop environments. That announcement may have hastened the release of the alpha, perhaps pushing it out prematurely, since there is very little that you can actually do with Plasma Mobile when you install it on a virtual machine. Click any of the icons — at least in my experience — and most of the time you get a flickering or frozen screen, forcing you to shut it down and reboot. So far, only the Setting icon works reliably. Still, like Plasma Active, Plasma Mobile does show off the efficiency of the KDE environment, providing what by my count is the third alternative to standard Plasma (the other, for those keeping count, was Plasma Netbook, yet another desktop since faded into obscurity). Beneath it is the familiar KDE; the command line, for example, is Konsole. As the few who bought the Aquaris M10 Ubuntu Edition tablet discovered, after suffering the clumsy vagaries of Android and iOS design, there is something reassuring about a device running Linux, using the standard software and being updated with a package manager. Plasma Active’s alpha happens to run on Ubuntu, and it even installs with Ubuntu’s familiar default directories: Documents, Downloads, Music, Pictures and Videos. Partly, what is reassuring is that the setup is familiar, but a large part is that it seems sane, being populated with software that is high-quality and free-licensed. The contrast to the junky apps of the Google Play store is nothing short of a relief, especially because of the lack of ads. Plasma Mobile even has a small homage to Plasma Active, in the form of a downward pointing arrow that, when clicked (or dragged, on a touch screen) displays the available applications. Otherwise, though, Mobile cannot compare with its predecessor is in making the most of the limited screen size of a phone. Like most other interfaces for mobile devices, it opens on a home screen, and clicking on an icon changes to a new screen, which also has a series of clickable choices. Drill down, and you can close the current screen, but not retrace the path you have taken to get there — a much less efficient arrangement that Plasma Mobile’s or Ubuntu Touch’s swiping from the side. The desktop environment is not much different from most of the others available for mobile devices, being adequate but not particularly well-designed. The most that can be said so far is that individual screens have a clean, minimalist design. They do not, however, work especially well together as a system. An alpha release is supposed to include no more than basic functionality. With the release conventions in mind, it is not the least surprising that the download page invites users to perform basic tasks such as adding a widget to the desktop, downloading an app, or using the comic. However, I was unable to attempt any of these things without freezing or crashing the virtual machine. That means that I can only hope for more stability and more functionality as Plasma Mobile moves towards general release. For now, once the novelty of running KDE on a mobile interface wears off, the main interest of Plasma Mobile is its default apps. The thirteen default apps are an interesting collection. Besides Konsole, it includes other standard aps, like the VLC Media Player and Marble. For a long time, I have been encouraging the use of Marble, whose use of Open Street Maps makes it a privacy alternative to Google Maps, and I appreciate seeing that others have had the same idea. 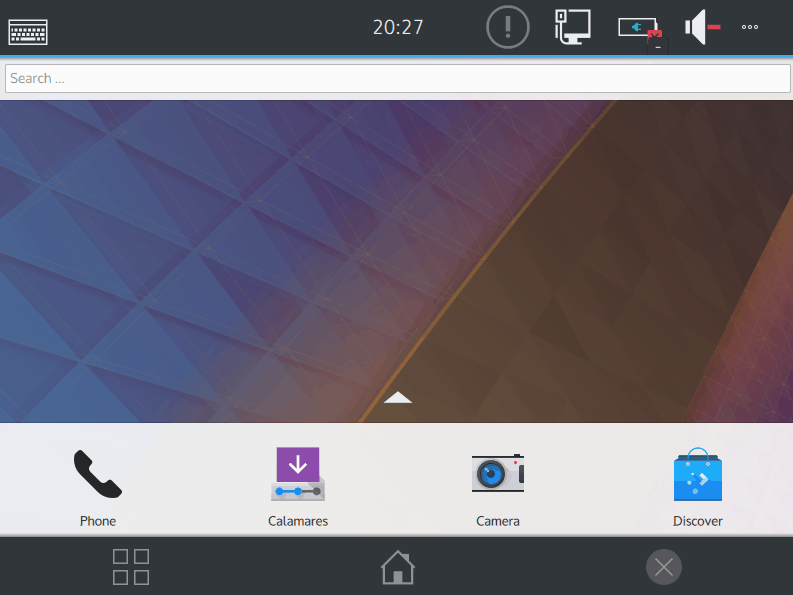 Other default apps appear to be designed specially for Plasma Mobile, such as the Kirigami Gallery, the Peruse comic reader, and the self-explanatory Take a Screenshot. Unlike classic KDE applications like Amarok and digiKam, these are not completist apps, trying to squeeze every bit of functionalty users might possibly need into the interface. Instead, they are minimalist apps, more what you might expect from GNOME than classic KDE — a reasonable choice for a phone, where few are going to attempt serious work, although possibly less so for a tablet. What makes the default apps worth looking at is the way they reflect Plasma Mobile’s positioning as an interface. This positioning is most obvious on the home screen. From left to right, the home screen includes four icons: Phone, the Calamares system installer, Camera, and Discover, the graphical software installer, which is roughly analogous to an app store. Three of these icons have equivalents on any Android phone, being common functions. Only Calamares is unusual, a reminder that the Librem 5 (and presumably any other device) will allow the installation of more than one distribution. What you do not see is any device to use Activities — and that, for me, suggests that the home screen is Plasma Mobile in a nutshell. Plasma Active was designed when KDE 4 was still relatively new, and its developers still wanted to celebrate their innovation and the fact that they were leading interface design. By contrast, Plasma Mobile designers seem more intent on delivering a familiar interface. What innovation exists seems driven by what Librem 5 requires than by Plasma Mobile. The choice can be defended. As KDE developers found when they released KDE 4.0, too much innovation can be offputting for users, especially when backwards compatibility is not provided. However, considering Plasma Active and Ubuntu Touch, a greater degree of innovation would probably be possible. In the last decade or so, free software in general and KDE specifically has shown on the workstation and the laptop that it was no longer playing catchup with proprietary interfaces, but leading innovation. Granted, Plasma Active is among one of the first attempts by free software to enter the mobile market, but the choice to concentrate on providing the equivalent to proprietary interfaces seems to me unnecessary. I am seriously thinking of buying a Librem 5 phone, and, if I do, I will probably use Plasma Mobile, since I prefer KDE to GNOME. However, under the circumstances, that is an unenthusiastic endorsement. If Plasma Mobile’s alpha release is a reliable indicator, the finished desktop environment will not be anything like it could be. I only hope that I am wrong. ← Plasma 5.12 – Long Term Sweetness? You have very succinctly characterized the problem: KDE released ‘Active’ in 2012, and a charitably-described alpha version of ‘Mobile’ last week. There is a total and complete lack of will on the part of the KDE team; there’s simply no other way to describe a five-year run of inactivity, of lack-of-results.